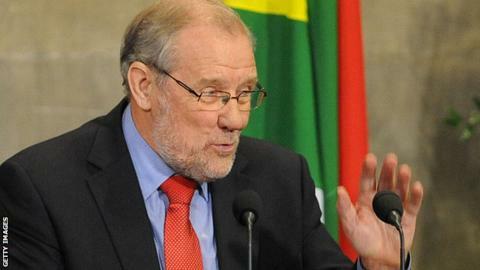 Former Sports Minister Richard Caborn says it would be an empty gesture to boycott the 2018 World Cup in Russia. European Union officials are reportedly considering calling for a boycott of the tournament as a protest against Russian actions in Ukraine. Caborn highlighted the 1980 Moscow Olympics when the United States were absent but a British team competed. "You'll end up having the world split down the middle, and that is the worst of all worlds," said the 70-year-old. "No one condones what is going on in Ukraine but it would be merely empty-gesture politics from those that did boycott the World Cup." Caborn, minister for sport between 2001 and 2007, was a leading voice in the sporting boycott of South Africa during apartheid but believes similar action against Russia would be ineffective. "Politicians often think they can institute a boycott but that can end up as being a show of weakness, not of strength," he added. "The sporting boycott of South Africa worked because there was a total consensus between sports and politicians - but there is not over Russia." Fifa president Sepp Blatter has said that the world governing body will not move the 2018 World Cup.